During the early spring, frozen land prevents melting snow or rainfall from seeping into the ground. Warmer temperatures and resulting snow melt can produce large amounts of runoff in a short period of time. The water runs off the surface and flows into lakes, streams, and rivers, causing excess water to spill over their banks. Add seasonal storms to the mix, and the result is often severe spring flooding. Flash Flooding: A flash flood is a rapid flooding of low-lying areas in less than six hours, which is caused by intense rainfall from a thunderstorm or several thunderstorms. Flash floods can also occur when there are drought-like conditions. 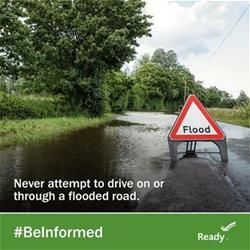 Flash flooding can occur quickly, even when it's not raining at your location. A flash flood is a rapid flooding of low-lying areas in less than six hours. Be safe: TURN AROUND, DON’T DROWN. Never drive your vehicle through flood waters. Nearly half of all flash flood fatalities are vehicle-related. Purchase flood insurance. See Flood Insurance for more information. EVERYONE IS ELIGIBLE, whether you live in a designated flood plain or not. Homeowners insurance DOES NOT cover flood damage. Remember: it typically takes 30 days for a new flood insurance policy to go into effect, so get your policy now. Never drive through flooded roadways. Roadbeds may be washed out under flood waters and just 18 inches of moving water can float a vehicle. Remove wet contents immediately. Wet carpeting, furniture, bedding and any other items holding moisture can develop mold within 24 to 48 hours. Clean and disinfect everything touched by floodwaters.